As I was sitting in front of my fan (it’s still miserable in LA), editing these photos, I quickly realized how silly of me for posting a burger recipe the day after Labor Day. You’re probably sick of burgers. Or maybe, like me, you had no American food at all. My Labor Day was full of some dim sum and Korean shaved ice and two small Mexican fish tacos. And some new and old friends. It was rad. These lamb burgers aren’t your traditional burgers anyway so I think it’s all good. In my dreams, these will be your dinner. They’re awesome and special. Yesterday was a nice and relaxing day; I’m glad I ended up taking the day off to enjoy myself versus my original, depressing plan of working. I’m happy I chose fun. You gotta choose fun sometimes, man. Sunday was so fun. There were sheep AND Amelia. It was incredible. I can’t even put the experience into words. There will be sheep pictures soon. It was a great way to end the weird month that was August. I’m excited for September but August was strange. These burgers are surprisingly light. I think it has a lot to do with the fact that lamb can sometimes (depending on the cut) be lighter than beef. And pitas are way lighter than big ol’ brioche buns (my favorite!). The tzatziki sauce, fresh tomato cubes and pieces of lettuce made this a dreamy burger situation. I loved it so much. The burgers are made with a nice mixture of sautéed yellow onions, spices like coriander, cumin, ginger, garlic and wait for it…chopped up pistachios. They add nice texture. I love ’em. Oh and the fresh parsley and mint were cool too. These would be a great weeknight dinner. Grill the burgers or cook ’em in a pan. Both are great ways to eat them. I’m currently on the search for air conditioning so I can veg out and watch the New Jersey housewives at that weird “spiritual” ranch in Arizona. So weird. In a small skillet add a teaspoon or two of olive oil. When hot, add the onions and cook for 3-4 minutes, until softened and translucent. Add the spices: pepper, coriander, cumin, ginger and minced garlic. Cook for an additional minute or so, until the entire mixture is fragrant. Turn off heat and let cool slightly. Meanwhile, mix together the ingredients for the tzatziki sauce. There's no way to mess this up: mix, taste and adjust according to how you like it. Get your toppings ready and warm the pitas in the oven, if you like. Heat a few tablespoons of olive oil in a medium skillet; when the oil is hot, add the lamb patties, cooking them 1 to 2 at a time. (Over crowding the pan will result in steamed patties.) Cook each of the patties for about 3-4 minutes per side for medium well. If you like your lamb well, then I'd recommend about 5 minutes each side. Repeat the process until all the patties are cooked. 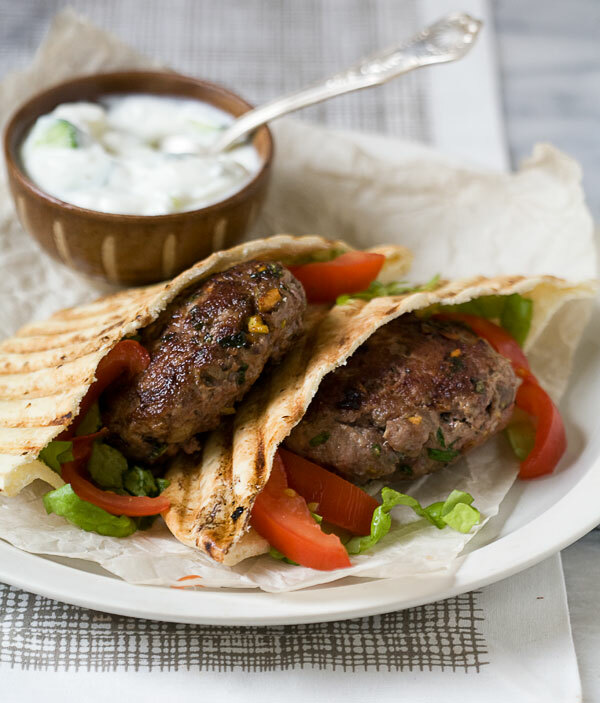 To assemble, place the lamb patties in the pitas, garnish with tomatoes and lettuce. Pour on tzatziki sauce liberally. It's good. These burgers look so good! I love pita bread so much, what a great substitution for the regular burger buns. I am never sick of burgers, sadly is often my down fall at BBQs. I am glad you took a good rest! Nothing like a bit of R&R for the soul. Loving the middle eastern influence in this burgers. These burgers sound great. Can you tell me how much ground lamb meat you need? This seems to be missing in the recipe. 1 pound! It’s in there now. Sorry about that. I can never have enough burgers! I’m a little ashamed to admit they are kind of…my favorite food ever! 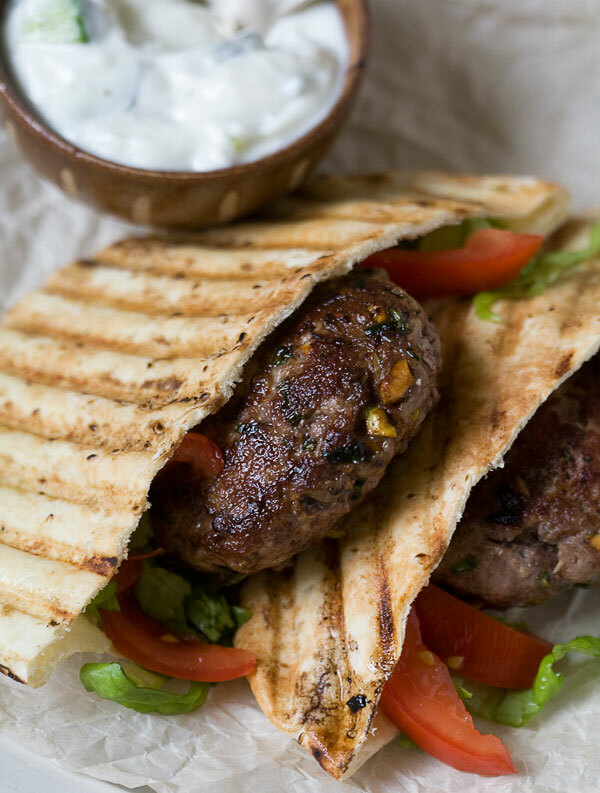 But I’d never thought of combining pitas and lamb burgers…they look delicious! Oh, and can’t wait to see Amelia’s photos with sheep! We eat ground lamb quite a bit but you’ve made me realize I’ve never made lamb burgers! Love the idea to add pistachios too. I do pitas with lamb meatballs but never a burger shape. This looks so good and pistachios? Makes my eyes roll back into my head thinking can it get any better. I think we are just headed into burger season with football coming! I love lamb and these sound so great with the Tzatziki sauce, too! I have never had any lamb! Growing up it was always beef and my family is picky, so no one ver wanted to try a different meet. So boring! But I love all greet food and have been dying to try lamb. These look like the perfect easy and delicious way to start. Heck yes! Oh and I do not think you can ever get tired of a good burger! Maybe it’s just me, but I can’t find the amount for ground lamb in the recipe. Maybe it’s a glitch in my browser! Not just you! I move too quickly and sometimes make mistakes. It’s in there now. Sorry about that! I watched that episode last night! So bizarre–I swear I’ve seen that horse guy on some other (reality) show before. I love lamb burgers–and top it off with some tzatziki sauce and I’m one happy camper. I sometimes add feta as well! Oh so good. Need to try your version, especially with all those great spices and pistachios (!). HAHAH! Dude, I’ve seen him before too, I swear it! 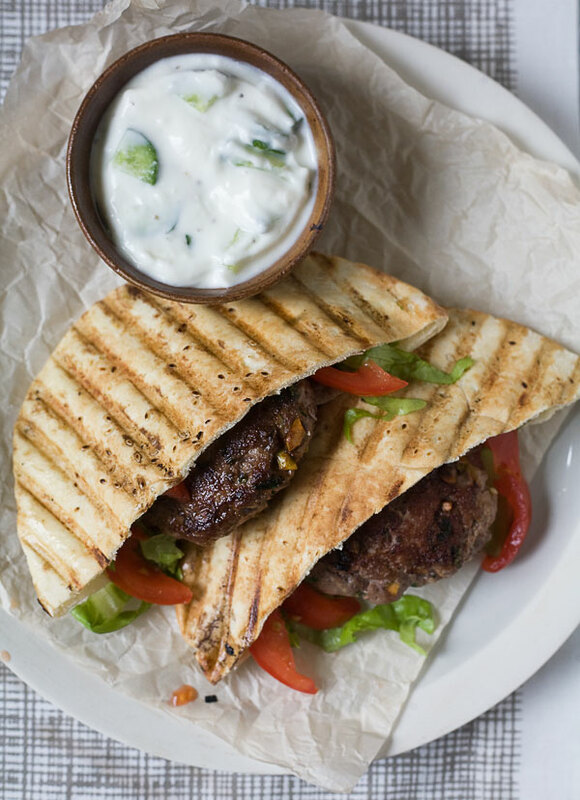 Lamb burgers are so good, especially with your accompaniments like pita and yogurt sauce. Yum! These sound fabulous! I may have missed it sorry but how much lamb do you use? Ah! It’s in there now. 1 pound. Sorry about that! Ah! Gorgeous, lamb + mint = awesome. I bet some oregano would go great in there too. This looks delish and I like the lower carb pita ‘burger’ idea. I’ll definitely try this and I will make a taco meat version instead of a patty. I find that breaking up the meat means you get to eat less meat and more vegetables. Well, I for one am absolutely not sick of burgers! Especially lamb burgers–they’re clearly the best. I love the idea of adding pistachio to the mix! 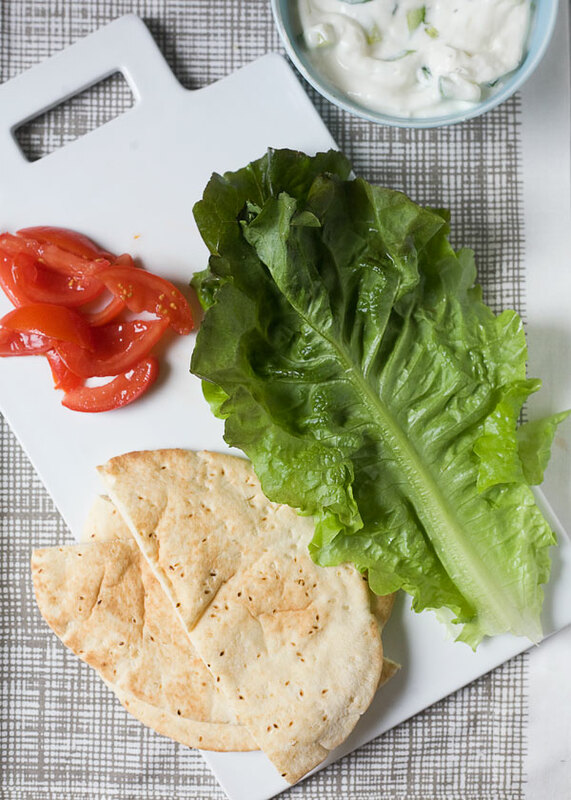 I love using pita to cut out a few carbs here and there. Definitely pinning this for later! yum! This is such a good idea! I’ll have to find some ground lamb and get on this. I love lamb and these look delicious! Can’t wait to try them. Holy yum. Where do you buy your ground lamb? Is it pricey? I’ve actually never bought it before but eat it all the time at our fave Mediterranean restaurant. Are you in Los Angles? If so, I got mine at Gelson’s in Silver Lake. It was $8 for 1 1/2 pounds. So pretty moderately priced. Sometimes Trader Joe’s has it too. I’m in Tejas. But, I’ll totally check Trader Joes or Central Market! Want this for dinner so bad!! G’day! Your burger and recipe look delicious, true! Love adding pistachios…these are now on my list to do! Thank you! Made these last night after reading your blog post. Oh my, they were delicious!!! I can’t wait to eat them again! My husband loved them, too. Thanks for a great recipe! This burger is lovely! Lamb goes so so well with all that spices. Really Greek in style. We had something similar in the Greek restaurant. With that tzatziki, perfect. these burgers are so unique and delicious. thanks for the recipe. How delicious! Were huge fans of burgers in my house and as were middle eastern, I love your spice mix that you used. Its so close to home, cant wait to try it out! Thanks!